The Courtyard by Marriott Manhattan Times Square West hotel is thrilled to be the only Courtyard by Marriott hotel in New York City to offer its guests the Full American Breakfast Buffet. The full breakfast buffet is open seven days a week, 6:30 a.m. to 10:30 a.m. Start your day off right with hearty, hot breakfast items like eggs, bacon, home potatoes, sausage and waffles; or enjoy a light breakfast of fresh fruit, pastries, New York-style bagels, yogurt and an assortment of cereals. Guests are also treated to all the juice and Starbucks® coffee they can drink. Adult guests of the hotel receive a discounted rate; children ten and under eat for free with each paying adult. 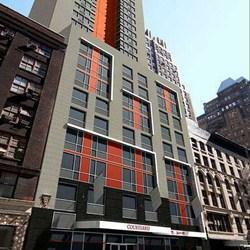 The Courtyard by Marriott Manhattan Times Square West hotel is New York’s newest hotel. Built from the ground up specifically for the New York Times Square hotel market, the hotel offers 244 modern, sophisticated hotel rooms with a variety of accommodations and amenities. Located right in the heart of the Fashion District, the hotel is a short walk to some of New York’s most iconic landmarks including Times Square, the New York theater and museum districts, Fifth Avenue, Penn Station, Port Authority and Javitz Center. The comfortable hotel rooms embody Marriott’s reputation for quality as well as the allure and excitement of New York City. Hotel amenities include free high-speed Internet, flat-screen HD televisions with HBO, concierge services, group meeting spaces and a 24-hour fitness center. The Courtyard Times Square West hotel is managed by 365 Hospitality Management.